If you can't make contributions to your retirement plan, your retirement dreams may not become reality. What would happen to your ability to save for retirement if you were hurt or too sick to work? Most people in this situation, with no income and increased medical bills, are forced to use their savings to meet everyday living expenses. It’s important to put a fallback plan in place to ensure that money continues to be put away for your retirement even if you become disabled. Can you afford a 42% loss to your retirement savings? 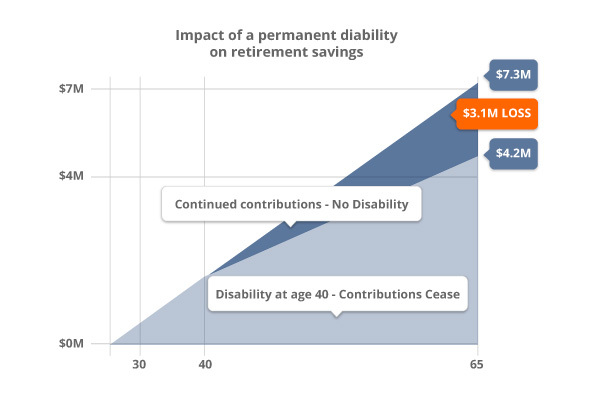 A permanent disability could disrupt your retirement savings, as shown here. If you can’t make contributions to your retirement plan, your retirement dreams may not become reality. Retirement Protection Disability Insurance helps you continue saving for retirement in the event of a disability. If you become disabled, the policy pays a benefit in the amount of your retirement plans monthly contribution into a special trust. The money in the trust is invested at your discretion until you reach age 65 and then distributed to help supplement your retirement income. It is not a pension plan. Rather, it is a program that provides disability income insurance to ensure your ability to make retirement plan contributions until the age of 65. The goal: to provide you with close to what you could have expected from the retirement plan if you had not become disabled. In addition to protection for your own retirement, it also makes an excellent benefit for select employees – or your entire staff.